It's not uncommon to hear storm chasers described as either professional or amateur chasers. There might be a very, very tiny fraction of chasers who make their entire income from storm chasing and nothing else. 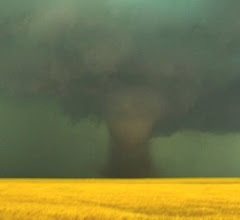 Such are the only chasers who might literally consider themselves professional chasers and their ranks are negligibly small compared with the number of people who chase storms. If that's the case, then essentially everyone else is an amateur! That's not a useful way to group storm chasers, so I'm proposing some new groupings. 1. As I've said many times, most all regular veteran storm chasers - those who make an annual storm chase trek and have done so more than a few times - are not seeking to become dependent on chasing for their livelihood. It's a hobby they enjoy for the thrill of the hunt and the awesome spectacle they can witness with their own eyes. Many spend a fair sum on chasing (my costs run about $1000 per week), and they may be able to offset that to a greater or lesser extent by selling photos and videos. Since these are people who have chased for several years, they may have accumulated considerable expertise in chasing techniques and learned a fair amount about storms even if they're not meteorologists. There are many different reasons for someone to be a regular chaser and those reasons usually dictate their personal chasing behavior choices. Some are willing to take on relatively high risk situations, others not so much risk. Not all veterans engage in responsible chasing, and anyone, no matter how experienced, can make serious mistakes, as we have learned this year (2013). 2. Then there are chasers who participate regularly in serious scientific field observations (perhaps in addition to their own personal chase treks) and are either students or practicing professional scientists. Let me call them scientific storm chasers. For anyone who has ever done this, it can be quite constraining compared to a private chase - you have duties and have to be in pre-assigned positions rather than just going for whatever interests you. This sort of chasing is hard work and its main reward comes when the data collected are used for scientific analysis of the storms, leading to publications in journals and presentations at scientific conferences. It's not at all about personal chasing goals. It's about contributing to the growth of scientific knowledge. That said, such chasers should accept a very high standard of responsible chase behavior: primarily regarding their driving on public roads. Unfortunately, not all of them do so all the time. 3. We have seen a growth in what I might call opportunistic chasing. These are people who chase primarily within a limited area, on occasions when storms develop nearby. I sometimes operate in this mode, when I'm not on my annual storm chase vacation - targeting storms in central Oklahoma, as I did on 20 May 2013. We have referred to this as a "gentleman's" chase - usually more or less leisurely and without all the complex preparations that a chase trek involves. Some local citizens, perhaps having seen storm videos on TV, venture out on storms near where they live, seeking to sample the chase experience without expending a lot of effort. Many such opportunistic chasers know very little about storms and sometimes behave very irresponsibly (including drunk driving!). Because such opportunistic chasers are ignorant and inexperienced, they can be a danger to themselves and others, adding to the problem of "chaser convergence" in certain situations. 4. Recently, there's been some growth in media chasers going out as sort-of 'spotters' for TV stations, providing on-scene reports of storms, including live video for the station to broadcast. Such chasers are usually restricted to a certain territory within or close to the viewing area for their sponsoring station. The quality of these media chasers varies considerably. Many of them are seriously deficient in their understanding of what they're seeing and doing, and some of them engage in very irresponsible driving behavior, and a few are prone to serious exaggeration of what they're seeing. A colleague and I wrote about them here. 5. Finally, there's the ever-changing group new chasers. They've just begun serious chasing and may or may not go on to become regular veteran chasers. Their experience level is low, their chasing tactics are still new and evolving, they may or may not yet have seen some major events. Many are defensive about their status as 'newbies' - feeling they may not get the respect they think they deserve. Respect from others as a chaser is earned over time, not something granted automatically. Some may have a lot to learn about chasing responsibly - others do so without much fanfare. A lack of experience always represents something of a danger in storm chasing. What happens in those first few years can have a large impact on how they develop as a storm chaser. Thus, I'm proposing five broad classes of storm chasers. Some individuals can appear in more than one of these classes. There can be a wide range of knowledge within each group, as the experience level can vary considerably. Thus, the distinction is not at all between "professional" and "amateur" chasers. Such words have little relevance in the real world of storm chasing.